Much of the research activity of the Center focused on the context of an online literacy environment designed specifically to use the power of digital environments to provide a novel approach to improving literacy and motivation for reading for our target population. This online platform, called Udio, served as both an intervention and a context for conducting research that served the Center’s mission. To become strategic and engaged readers, students need sufficient opportunities for active practice. They need this practice in order to acquire and develop fluency in critical reading comprehension skills. With traditional instruction, students may be compelled to read, but that demand does not necessarily become actual reading practice by students. Students need to interact with voluminous amounts of text to build reading skills and use those skills across content areas. What can encourage students already resistant to reading to do the quantity and optimal challenge level of reading that will develop and build reading skills? Leveraging student motivation.transferring reading skills. Building the motivation to read, then, is of utmost importance.The pace of instruction and the rate at which practice occurs needs to be significantly increased. To achieve this goal any successful literacy program must provide deeply engaging opportunities for reading practice across the curriculum—practice that is a just right challenge for each individual student. to substantially improve the reading comprehension skills of middle school students who have experienced recurrent failure in the domain of reading. Udio combines modern web technologies and current evidence based practices to provide sustained, rigorous, and personally optimized apprenticeships in literacy. Providing readings that are rich with Universal Design for Learning supports and scaffolds — readings are effectively “tuned” to students’ specific strengths and weaknesses. Udio’s design is based on the framework of Universal Design for Learning (UDL). UDL is a set a principles and guidelines that serve as a framework for curriculum design and educational decision-making. These principles provide a blueprint for creating instructional goals, methods, materials, and assessments that work–not a single, one-size-fits-all solution but rather flexible approaches that can be customized and adjusted to address the variability of all learners. To learn more about Universal Design for Learning visit the National Center on UDL or access the free online book Universal Design for Learning: Theory and Practice. What are the main components of UDIO? What support does UDIO provide for teachers? 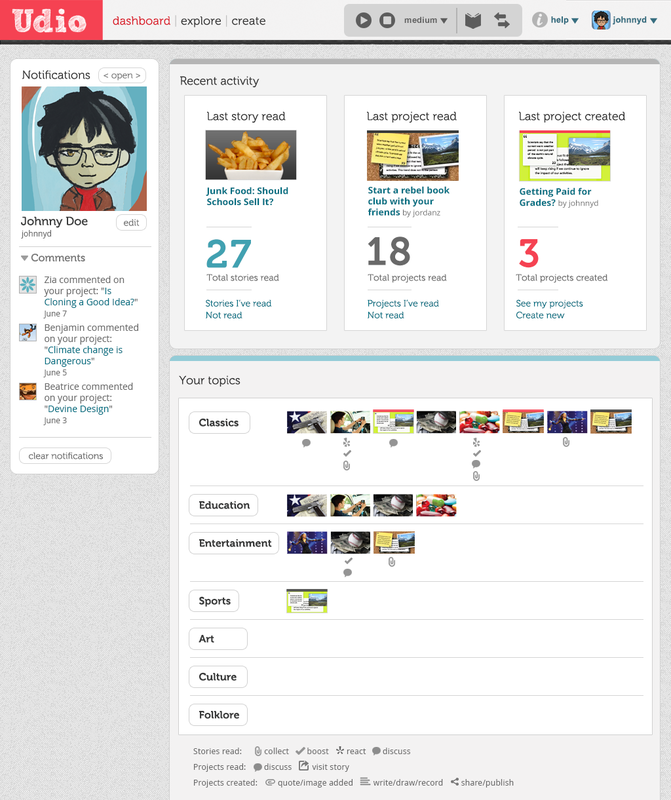 Teachers are highly supported in Udio with their own digital dashboard and a teacher site that compliments the student site. 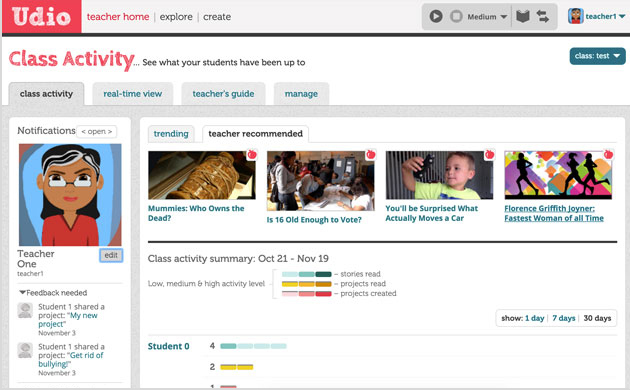 Here teachers can view activity in real-time during a class period and student activity over time, which includes details about the kinds of supports and features students utilize. A comprehensive teacher guide includes mini-lessons and suggestions for connecting Udio to the classroom curriculum. Boucher, A. R., Evans, M., & Graham, S. (2015). 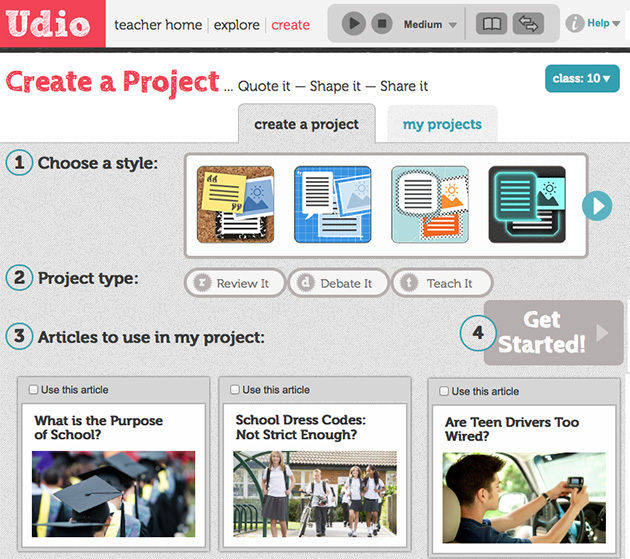 Udio: Rich and authentic literacy experiences for struggling middle school readers. In S. A. Crossley & D. S. McNamara (Eds. 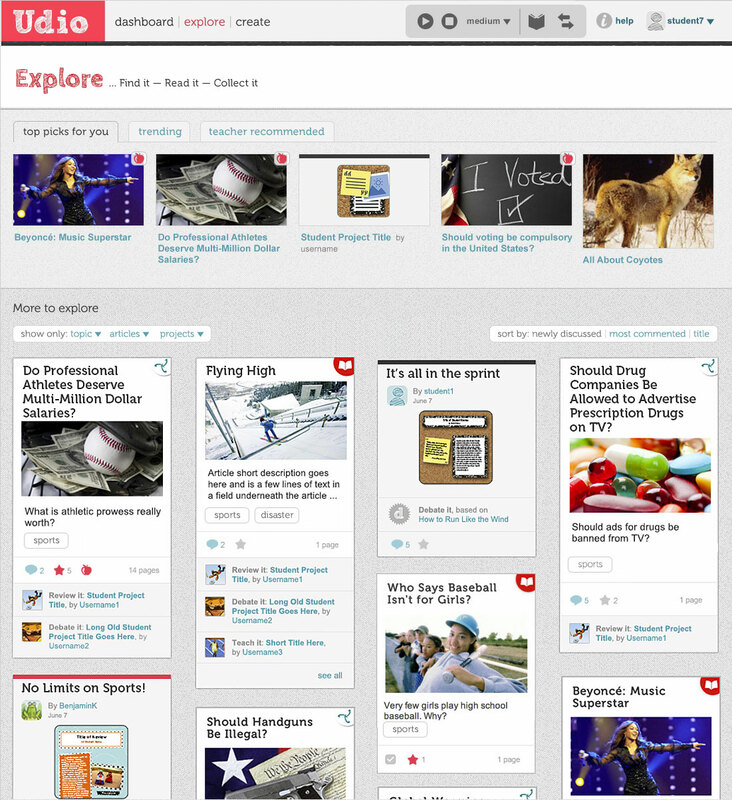 ), Adaptive educational technologies for literacy instruction. New York, NY: Taylor & Francis, Routledge. Coyne, M., Evans, M., and Karger, J. (2017). 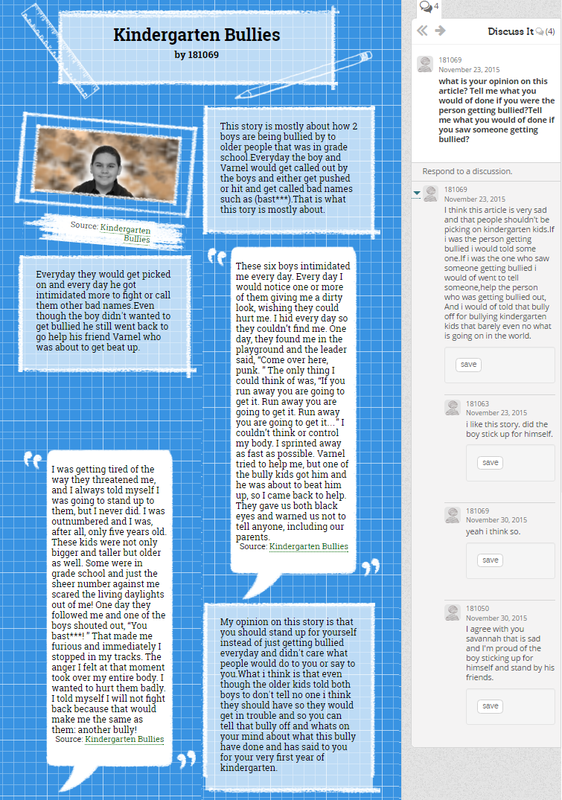 Use of a UDL Literacy Environment by Middle School Students With Intellectual and Developmental Disabilities. Intellectual and Developmental Disabilities: February 2017, Vol. 55, No. 1, pp. 4-14.